We had the following supervisors aiding our project. Nick Coleman is a microbiologist with an interest in environmental microbiology and biotechnology. He completed a PhD at the University of Sydney studying explosives-degrading bacteria, and in his work as a postdoc at Tyndall Airforce Base in Florida, USA he isolated the first and currently only bacterium able to grow on dichloroethene as a carbon source. He then returned to Sydney to study mobile genetic elements in Pseudomonas stutzeri, leading to a new method for quantifying integron activity, and now runs his own lab in the School of Life and Environmental Sciences. Nick’s research spans across metagenomics, microbial ecology and diversity, and agricultural microbiology, but is focused on molecular genetic analysis of bacteria capable of degrading pollutants, and the role of mobile genetic elements in bacterial adaptation to hostile environments. He has lectured to students across many degree programs and co-ordinated courses and practical classes for multiple microbiology units. His work has been supported by ARC Discovery grants, a NSW Environmental Trust Grant, and collaborations with industry partners such as Orica. Nick helped us design the sequence for Winsulin, and developed our insulin expression system as well as instigating the project. The amount of work Nick did for this project cannot be quantified. From troubleshooting endless gels, digestions, ligations, transformations, PCRs, more gels, protein extractions, inductions, purifications, and even more gels, to replying to our many panicked emails about upcoming events and looming deadlines, to giving us the space to work in his lab and organising a great deal of our outreach events, Nick has given so much to our project and we absolutely could not have done it without him. Jacqui Matthews is a protein biochemist with an interest in the regulation of protein-protein and protein-DNA interactions in disease. She uses techniques such as molecular biology, biophysical methods and structural methods to investigate protein interactions in diseases including T-cell leukemia, beta-thalassemia and breast cancer. Jacqui assisted with the design of the Winsulin sequence, and advised the development of our insulin expression systems. Ed Hancock is a mathematician and engineer who is interested in systems and synthetic biology. He completed a BE and BSc at at the University of Sydney, and a DPhil at the University of Oxford. He was subsequently a post-doc at the University of Oxford, and has been a visiting researcher at Imperial College and Caltech. Ed gave Ruby weekly tutorials and advised us on the development of our modelling. We had the following amazing PhD and Honours students aiding our project. Yanwei is a PhD student in the Coleman lab. She kindly provided us the plasmid for Bacillus expression pUS258 and the protocol for Bacillus transformation, as well as assisting with our transformations into Bacillus. She was very supportive of our team both in and out of the lab! Mark is a research assistant in the Coleman lab. In his role as an advisor for our project, Mark helped us troubleshoot many of our experiments and master new techniques, as well as teaching us the ins and outs of working in the Coleman lab. Mark’s experience as a member of the 2015 iGEM team was invaluable to us throughout the project, and the support he gave us is greatly appreciated. The 2016 team gave us great advice and support throughout the project. We had the following advisors aiding our project. Len Mancini is a partner at Maxwells Patent and Trade Mark Attorneys who specialises in intellectual property law. He very generously donated his time to advise us on the IP laws regarding our Winsulin sequence and our insulin production method. Neil Donelan is an insurance assessor at the not-for-profit organisation Insulin for Life. He advised us on the issues relating to insulin transport internationally, informing our project design. Narcyz Ghinea is a bioethicist at Sydney Health Ethics. He advised us on the issues and ethics regarding the prices of life-saving pharmaceuticals, informing our project design and applied design. David Beran is a researcher at the University of Geneva. He is currently a co-leader of the ACCISS study, which investigates insulin accessibility on a global scale. He talked to us about barriers to entry into the insulin market, directly informing our applied design. Andrew Hoy runs the Lipid Metabolism Laboratory at the Charles Perkins Centre in the Sydney Medical School. He provided adipocytes for the glucose uptake assay, allowed our team to work in his lab to complete the glucose uptake and ELISA, and assisted the team with the completion of both experiments. We were also assisted by two members of his lab, Toni and Shilpa. This experiment was the final piece of the puzzle in proving that our insulin was functional. We would like to thank him for generously giving up his time to assist in this crucial stage of our project. We have to send our thanks to the following people whose contributions made a great difference to our project. Peter Arvan is from the University of Michigan. Our Winsulin sequence is strongly based on an insulin he designed in his 2009 paper Single-Chain Insulins as Receptor Agonists. He kindly gave us his blessing to work on it and assured us that he had no patent claim on it. Sui-Lam Wong is from the University of Calgary. He kindly provided us with the protease-deficient Bacillus subtilis strain WB800. Simon provided our team with NovoRapid Insulin aspart to compare our human proinsulin and Winsulin to in later experiments. 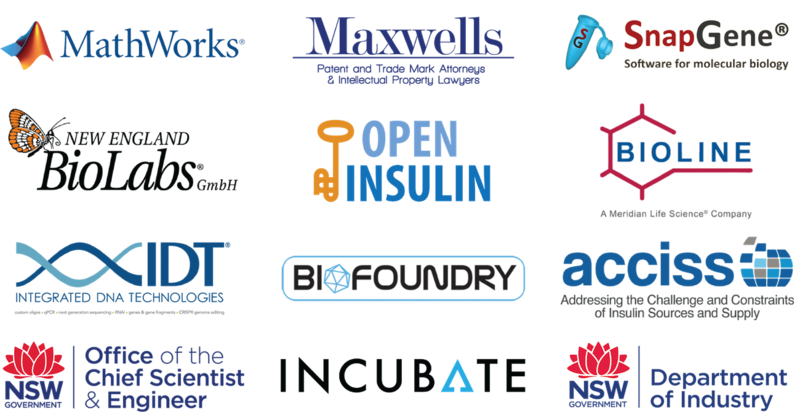 Anthony Di Franco of Counter Culture Labs instigated the Open Insulin project in 2015. Meow-Ludo Meow-Meow then formed a node of the project at Biofoundry in Sydney, which was subsequently adapted into an iGEM project by Nick Coleman. Without the involvement of everyone at Open Insulin and Biofoundry, we would not have this iGEM project.